Money orders are available at post offices, retail stores, and financial institutions like banks and credit unions. In most cities and towns, you have numerous choices. Here’s a quick overview of your options along with the pros and cons of each one. Retailers: When convenience or cost is most important, it may be best to get a money order at a retail store. Grocery stores, big-box stores, pharmacies, and convenience stores often offer money orders at the customer service desk. While you’re out running errands, look for a MoneyGram or Western Union logo at nearby stores. Fees to purchase a money order at most retailers are often around one dollar. Potential sources include Walmart, CVS, K-Mart, Safeway, Kroger stores, Meijer, 7-Eleven, and more. Banks and credit unions: Your bank is also a good option. Expect to pay a few dollars more than you'd spend at a grocery store (banks often charge $5 to $10). But the fees should be reasonable if you have a checking or savings account there and you only buy money orders occasionally. For more frequent purchases, you'll probably want to find an alternative. The main benefit of a bank or credit union money order is customer service—they’re likely to make tracking the money order easier for you. Some banks may only offer cashier’s checks instead of money orders, but your payee might not care which one you use. US Postal Service: USPS money orders are another excellent choice. These money orders have a reputation for being safe around the world. However, getting a USPS money order can be hard—not all post offices issue money orders (call ahead to confirm), and you might find yourself waiting in line. USPS money orders cost as little as $1.20 each. Money stores: Establishments that deal with money (besides banks and credit unions) also offer money orders. Western Union agents, payday loan shops, and other money transfer services may be conveniently located and offer low prices. Some websites promise that you can get money orders online, but it is difficult and risky to do so. It’s important to work with a name both you and your payee trust—you don’t want to get scammed, pay too much, or have your payee worry about whether or not the money order is legitimate. Cost varies from location to location, but you can expect to pay between one and ten dollars for a money order. Retail stores cost less, and banks typically charge more. Keep in mind that you might have to buy multiple money orders and pay a fee for each one. For example, if you need $3,000 and the maximum money order issue amount is $1,000, you'll need to pay three fees to get three money orders. For more details, read about money order costs and see sample pricing at selected locations. Payment: To buy a money order, you’ll need to pay with cash or a debit card. Because issuers guarantee money orders, you can’t just write a check or use a credit card. Issuers can’t be certain whether or not your check will bounce or if you’ll file a chargeback with your card issuer. As a result, they only issue money orders after you pay with guaranteed funds. Using credit cards: Some issuers say you can use a credit card to buy a money order, but you’re actually getting a cash advance on your card. Cash advances are typically an expensive way to borrow because they come with hefty fees, and credit cards charge high interest rates on those balances. Fill it out: To complete a money order, you’ll need to know who it’s payable to. Provide a specific name for the person or organization that you’re paying, and avoid making money orders payable to cash. The process is similar to writing a check. For more details, see How to Fill Out a Money Order. Is there a better way to make payments? Money orders often do what you need, but they cost money, and it can be a hassle to buy them in person. When a seller or recipient requires that you use a money order, you don't have any choice. But if you're using a money order just because you don't have a checking account, you may have better alternatives available. Bank account checks: The first step is to evaluate whether or not it's worth opening a checking account. Banks and credit unions still offer free checking, so you don't necessarily have to pay fees. Even if you end up paying modest fees, a bank account can still save you significant time and money if you’re already paying fees to buy money orders. Prepaid cards: If using a bank isn't an option for you (or you prefer not to work with banks), prepaid card accounts offer some of the same features as checking accounts—without the need to pay bank fees or get approved. In particular, you can pay bills from those accounts, which might mean you'll need fewer money orders in the future. Instead, you’d make online bill payments through your prepaid account, and your bank can print and send checks for you. No matter where you get your money order, keep your receipt in a safe place until you're sure you won't need a refund. If the money order goes missing or your plans change, you'll need that receipt to have the money order canceled. Without it, you might be out of luck, or you’ll face additional delays and costs to get your money back. 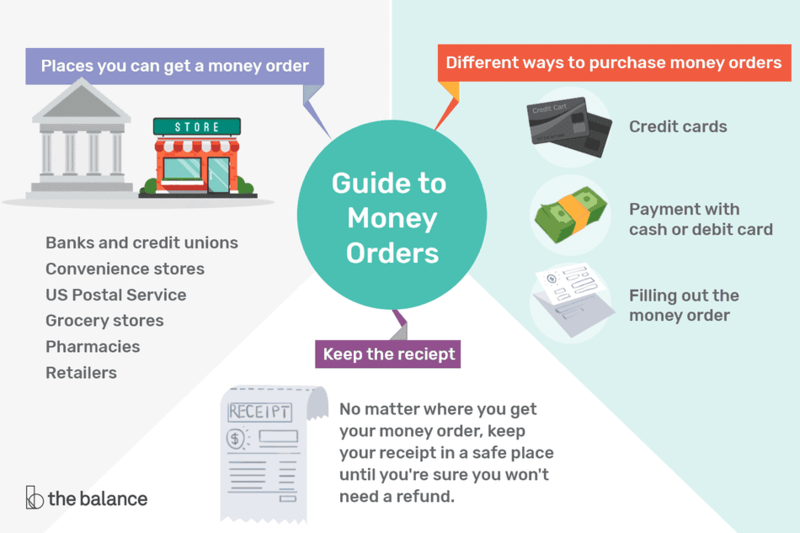 What's the Difference Between a Money Order and a Cashier's Check?